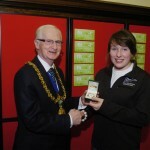 Club member and SCA Scottish Performance Squad paddler Paula Henderson has received an award from the Fields in Trust (FIT). At a ceremony on 24 March in Dundee City Chambers, the annual Fields in Trust Awards for sporting achievement were presented to a group of young Scots athletes covering a wide range of sporting disciplines. The athletes were nominated by their Scottish sports governing bodies for their significant achievements in the 2008 season. To set the tone for the evening and to inspire all present, the FIT “Sports Personality of the Year” award was presented to triple gold Olympian Sir Chris Hoy, which was collected on his behalf by Jackie Davidson, CEO of Scottish Cycling. Paula was recognised for her excellent progress and achievements in 2008. As the Under 14 Girls Scottish Champion and with Gold, Silver and Bronze medals secured in the 2008 British Championships, Paula was recognised as having a great chance to become a British internationalist in the future. Paula is sponsored by the Tayside and Fife Area Institute of Sport. The club wish her well for another successful year! Also awarded was Linlithgow Kayak Racing paddler Sean Redmond. Kirkcaldy paddlers enjoyed a glorious Spring day at Ratho on Sunday for the third marathon event of the Scottish season. In excellent conditions, Rachel Syme took first place in the Under 12 girls lightning race and in the boys Under 12 event Iain Chapman came first with Blair Henderson in third place. The mini course saw Paula Henderson take first place, in a new record time, ahead of Rhonwen Smith of Linlithgow with Colin Chapman in a meritable third place.